Completing an important project, conference or a capstone for the year provides the perfect occasion to celebrate and reflect on the experience. Celebrations are a necessary part of the process. Setting aside time to share and enjoy the moment makes the hard work and time involved even more rewarding. 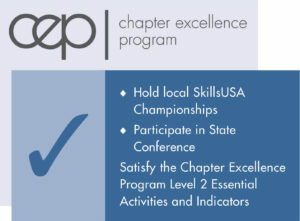 It gives students a strong sense of individual and team accomplishment, provides a venue to show off results and builds enthusiasm for future chapter events and projects. It also provides an opportunity for reflection, allowing students to take a closer look at their specific roles and how skills gained can help build their résumé. Here are some ideas to help maximize celebrations and reflection. Host a banquet and invite spouses or significant others, administrators and community partners. Host a cookout and game night. Present a certificate to each student and/or a team or chapter photo. Individually or via committees, recognize students for what they specifically accomplished (such as teamwork demonstrated, leadership assumed or organizational skills implemented) in front of the entire SkillsUSA chapter. Host an appreciation circle. Individually, each participant takes the chair at the “head” of the circle and all of the other participants recognize that person specifically for his or her contributions to the officer team, committee or chapter. Every member of the group takes a turn at the “head” of the circle. Host a fun activity at a local facility (bowling alley, miniature golf, swimming pool). Post photos and names of students on a bulletin board in the classroom or around campus. Put an announcement in the campus bulletin, newsletter, webpage or social media. Hang posters in the classroom with photographs and names of students involved. Recognize participants at a campus assembly or faculty meeting. Create a presentation including the project and successes to present to the campus administrators or dean. Be sure to have students provide personal testimonies about what they gained through the experience. Conduct a drawing with a cool prize at the wrap-up of the celebration event. Have students write a résumé that reflects the personal, workplace and technical skills they have gained from being actively involved in the project or the chapter. Create “Wordles” to help students identify what they have learned by participating the project, serving as an officer or being a member of the chapter. As a group, create a “Top 10” list of accomplishments and hang in the classroom or hallway. Involving an officer team or committee, have students create a “what I learned” list of thoughts and ideas that will be opened by the next year’s officer team or committee.